Rio Jordan performs at the 23rd annual Narciso Martinez Cultural Arts Center Conjunto Festival in 2014. The City of San Benito and the arts center are at in impasse over negotiations to host the festival in San Benito. 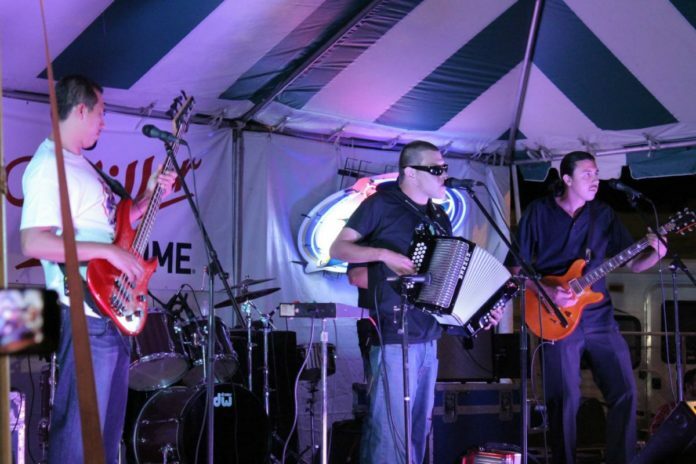 SAN BENITO — Both parties are blaming the other for a breakdown in negotiations to stage the annual Conjunto Festival. Yesterday, the leader of the Narciso Martinez Cultural Arts Center accused the city of “killing” the Conjunto Festival, which was set for October. Rogelio Nuñez, founder of the arts center, said the city’s “demonizing” of the center’s “accountability and transparency” led negotiations to break down. “The city government of San Benito killed the Conjunto Festival,” Nuñez stated yesterday. The city strongly denied the accusation. “(I)t was Mr. Nuñez who walked away from the negotiations we were having with him,” city spokeswoman Martha McClain stated. Meanwhile, the city is considering holding a musical event while the arts center discusses staging its own Conjunto Festival in cities including Brownsville, Los Fresnos, Weslaco, McAllen and South Padre Island. Last week, Nuñez told city commissioners he would cancel the three-day festival if the city did not reduce its request for $17,365 in fees it said it would charge to help cover costs associated with holding the event. But the city stated Nuñez did not respond to its offer to reduce fees to $7,000. Nuñez argued an ordinance states the city charges $200 for use of San Benito Plaza, where the arts center has held its festival for years. But yesterday, the city stated fees included $4,690 to assign police to provide security, $4,690 to rent San Benito Plaza for the three-day event and other fees to cover expenses such as clean up costs. >> 11 a.m. Aug. 3. Nuñez meets with McClain and Luis Contreras, the city’s museum coordinator, to discuss the $17,365 in fees. >> During discussions, Nuñez said, “the city was willing to enter into a partnership” if the art center agreed on certain conditions. As a result, the arts center offered paying $5,000 in fees while agreeing on the city’s conditions, Nuñez said. >> 3:50 p.m. Aug. 3. The city issues a press release “demonizing” the arts center, accusing it of a “lack of accountability and transparency,” Nuñez said. “The city did not call me to respond to our $5,000 offer as I was anticipating and, instead, the city decided to go to the press without informing me,” Nuñez said. >> 7:45 a.m. Aug. 4. Nuñez said he sent an email informing Contreras the festival was canceled. >> Noon, Aug. 4. Nuñez said City Commissioner Rene Villafranco called, stating De La Rosa reduced fees to $7,000. >>5:51 p.m. Aug. 4. Luis Contreras, the city’s museum coordinator, sends Nuñez an email proposing to lower the fees to $7,000. The city denied breaking down negotiations. Meanwhile, the city is considering holding a music event to raise money for its coming museum complex, McClain stated. At this time, it is unknown whether the arts center will continue to use the city’s old library building as its headquarters. For 20 years, the arts center leased the old library building for $1 a year. Then two years ago, the center’s lease building expired. “The city is preparing a user-fee agreement for use of its city properties,” McClain stated.